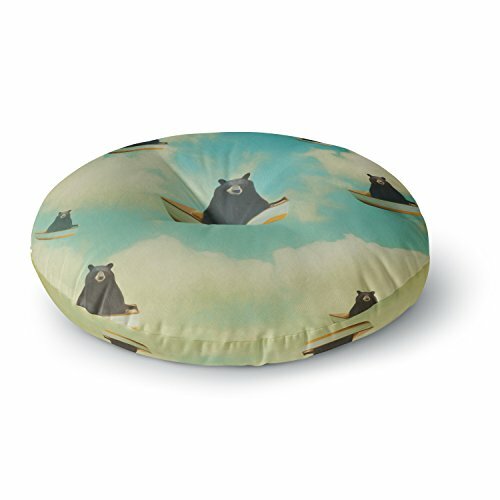 KESS InHouse Natt Bears Floating Animals Round Floor Pillow, 26"
Make your floor your new favorite hang out place with the new KESS InHouse tufted floor pillow! available in two different sizes, these pillows are sure to make your floor the coziest spot around. Great for reading corners, binge watching TV, or for adding extra seating for all those party guests, floor pillows are the new "it" thing. Made of polyester with a poly-cotton fill, these pillows are sure to add a pop of color and design to your floor space. KESS InHouse Angie Turner Giraffe Animal Round Floor Pillow, 26"
KESS InHouse Cristina Bianco Design Sleeping Cats Zzzz Teal Animals Round Floor Pillow, 26"
KESS InHouse Angie Turner Happy Goat Smiling Animal Round Floor Pillow, 26"